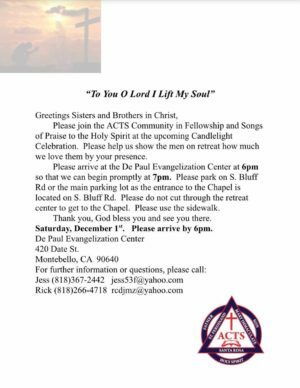 Dear ACTS Community, Please continue to pray for our ACTS Brothers who will be serving on the upcoming Men's ACTS Retreat (November 29 to December 2nd, 2018) as well as for the Men who will be attending the Retreat. 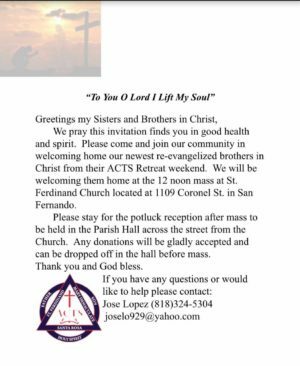 This is a special invitation to ask you to join us at the Off-Site events in support of the Retreat: SEND-OFF will take place on Thursday, November 29 at 5 PM at Santa Rosa Parish in San Fernando. CANDLELIGHT will take place on Saturnday, December 1st at the De Paul Evangelization Center in Montebello at 6:00 P.M. (Information attached) and finally, join us at the RETURN MASS on Sunday December 2nd at Noon at St. Ferdinand's followed by a RETURN RECEPTION at the Parish Hall (Information attached).